The next best thing to knowing something …. * Within the Help Menu, there is an “effects reference” help section that will cover most, if not all, the effects menu. 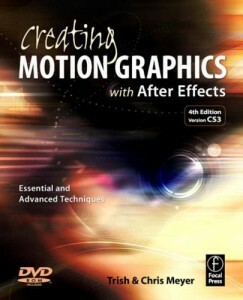 * Also check the wonderful text book Creating Motion Graphics with After Effects by Trish and Chris Meyer. * It is a valuable reference and belongs in every animator’s, editor’s and VFX artist’s library. * Look up the topic in the back, in the index, and it will take you to the pages that cover the subject of interest. * “Develop a mentorship with someone more experienced than yourself. It’s a great way to pick up hints and tricks, as well as a critical voice. There are a lot of resources out there in print and on the internet. Almost anything you want to know about After Effects is covered to one degree or another. So, don’t get paralyzed in your creative process. Be assertive and search out what you want or need to know. Yeah, you would think it was one of the world’s best kept secrets! My wifey tells me I am a “blue” personality. (In true form) I ask, What’s that, Honee? She tells me I am the type that needs any and all information on any given subject I am curious about, and on top of that, I’m pretty much curious about most everything, by nature of being. So yeah, The next best thing to knowing something …., I concur with eleventy billion %. And in this, The Information Age we now live in, it could not be a better epoch for a “blue,” eh. Peeps often ask me, how do you know so much about computers and the programs you use? And I reply, Well, I read the manuals, and I always use the on-board Help system(s) to ferret out an answer any Q I come up against. They look at me and ask, There’s a Help system on a computer?